This entry was written by Carol, posted on 8 May, 2009. Filed under In general and tagged cognitive, complexity, design, education, interface. A short research paper I wrote for the Master in Theory of Communicational Design in which I compare different ways of representing complex concepts and turning them into understandable and simple statements lead me to Visuwords. I am interested in the use of interaction interfaces that respond to the dynamic relations between body/mind, subject/object, matter/energy and the examples selected show the creation of cognitive spaces that with the use of mixed media tools achieve the representation of complex data in a simple way, or to explain wicked processes to a general public that, in another context, would have found them impossible to comprehend. In our actual context is important to invent other conceptual instruments and create new tools that will allow us to navigate mobile teritories and multidimensional spaces. “El juego de los vínculos” Denise Najmanovich, 2005. 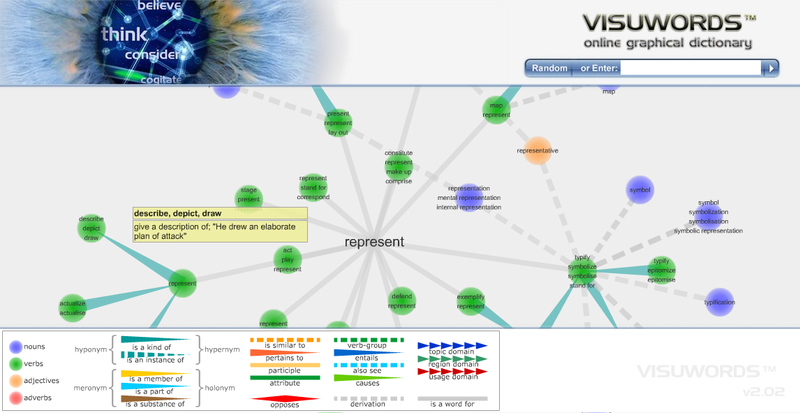 I came across Visuwords™ online graphical dictionary, a Flash interface that shows the contents of WordNet® “an electronic lexical database, considered to be the most important resource available to researchers in computational linguistics, text analysis, and many related areas”as defined by the project director George A. Miller. In 1985 many cognitive psycologists and computational linguists were formulating word meanings in terms of networks, diagrams with nodes to represente meanings and darts to represent relations between the meanings. “WordNet. An Electronic Lexical Database”, edited by Christiane Fellbaum. With Visuwords you can look up words finding not only meanings like in a traditional dictionary but associations and concepts related. The diagrams are like a neural net, creating a powerful graphic representation of this relational association. In Visuwords website you can find detailed information on how it works: enter a word into the search box and a graphical tree with nodes appears with the selected word in the center. Double click a node to expand the tree, click and drag the background to move around or the nodes to expand connections, zoom with the mouse wheel. Hover in over nodes gives you a definition.